‘Hey, we’re actually going to be doing a tracking session this evening if you’d like to swing by.’ It was just kind of ad hoc, but I thought, ‘Well yeah.’ I went in and…they had a session band in, and the session band was going through and just recording a bunch of different artists that would come in…What was really interesting is that these guys, even if you’ve even accidentally listened to country music over the last 10 years or 15 years, you’ve likely heard some of these folks on the record. The drummer, I know his work, toured and worked with Reba McEntire for like 15 years. The guitarist that was in the recording, I think he got the Nashville Guitarist of the Year or something last year…It was that moment that I realized that I was standing amongst giants and really had, at least somewhat, stumbled into the big leagues. Jamie also inspired Jones with his perfectionistic streak. The highly sought-after Grammy and Emmy award-winning recording engineer, mixer, and producer has a penchant for going through old projects and remixing work he’s already done, trying to outdo himself and find something else in the mix. 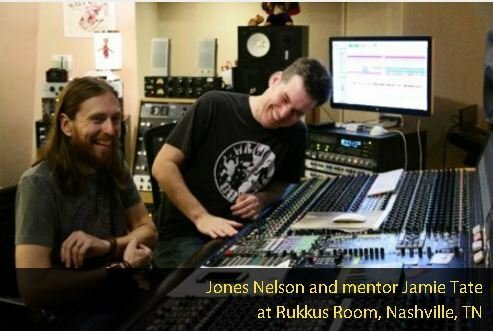 Jamie’s tenacious spirit has rubbed off on Jones who’s going full-force, working on his own album and teaming up with Nigel Pawson of Adelaide, Australia on the NonSkid Blondes project which is seeing plenty of interest from a number of music labels.